Alzheimer’s disease tragically ravages the brains, memories and, ultimately, personalities of its victims. Now affecting 5 million Americans, Alzheimer’s disease is the sixth-leading cause of death in the U.S., and a cure for Alzheimer’s remains elusive, as the exact biological events that trigger it are still unknown. In a new study published today, Arizona State University-Banner Health neuroscientist Salvatore Oddo and his colleagues from Phoenix’s Translational Genomics Research Institute (TGen) — as well as the University of California, Irvine, and Mount Sinai in New York — have identified a new way for brain cells to become fated to die during Alzheimer’s disease. The research team has found the first evidence that the activation of a biological pathway called necroptosis, which causes neuronal loss, is closely linked with Alzheimer’s severity, cognitive decline and extreme loss of tissue and brain weight that are all advanced hallmarks of the disease. “We anticipate that our findings will spur a new area of Alzheimer’s disease research focused on further detailing the role of necroptosis and developing new therapeutic strategies aimed at blocking it,” said Oddo, the lead author of this study, and scientist at the ASU-Banner Neurodegenerative Disease Research Center at the Biodesign Institute and associate professor in the School of Life Sciences. The findings appear in the advanced online edition of Nature Neuroscience. Necroptosis, which causes cells to burst from the inside out and die, is triggered by a triad of proteins. It has been shown to play a central role in multiple sclerosis and Lou Gehrig’s disease (amyotrophic lateral sclerosis, or ALS), and now for the first time, also in Alzheimer’s disease. Winnie Liang, TGen assistant professor, director of TGen Scientific Operations and director of TGen's Collaborative Sequencing Center, said MLKL executes necroptosis to ultimately cause cell death. “In this study, we show for the first time that necroptosis is activated in Alzheimer’s disease, providing a plausible mechanism underlying neuronal loss in this disorder,” said Liang, who contributed to the study’s gene expression analyses. Next, they identified the molecular cascade of necroptosis activation, with RIPK1 activating RIPK3 by binding with it. This protein complex then binds to and activates MLKL. Analysis of mRNA and protein revealed elevated levels of both RIPK1 and MLKL in the postmortem brain tissues of patients with Alzheimer’s when compared with normal postmortem brains. This work was supported by grants from the Arizona Alzheimer’s Consortium and the National Institutes of Health (R01 AG037637) to Salvatore Oddo, and R01 NS083801 and P50 AG016573 to Kim Green. Brain tissue is prepared for analysis. Human brain samples were provided by the Banner Sun Health Research Institute Brain and Body Donation Program of Sun City, Arizona, a world-leading, community-based resource to advance our understanding of neurodegenerative diseases. “We anticipate that our findings will spur a new area of Alzheimer’s disease research focused on further detailing the role of necroptosis and developing new therapeutic strategies aimed at blocking it,” said Oddo, the lead author of this study and scientist at the ASU-Banner Neurodegenerative Disease Research Center at the Biodesign Institute. Antonella Caccamo, assistant research professor, ASU-Banner Neurodegenerative Disease Research Center, is a first author on the study. Data for the RIPK1 causal regulatory gene network were generated from postmortem brain tissue collected through the Mount Sinai VA Medical Center Brain Bank and were provided by Dr. Eric Schadt from Mount Sinai School of Medicine. The computational resources and staff expertise provided by the Department of Scientific Computing at the Icahn School of Medicine at Mount Sinai also contributed to the performance of this research. Single tickets for the groundbreaking, Tony Award-winning hit "Fun Home" at ASU Gammage will go on sale Monday, July 31 at 10 a.m.
To purchase "Fun Home" tickets, visit asugammage.com or call the Box Office at 480-965-3434. Based on Alison Bechdel’s best-selling graphic memoir, "Fun Home" introduces us to Alison at three different ages as she explores and unravels the many mysteries of her childhood that connect with her in surprising new ways. A finalist for the Pulitzer Prize, "Fun Home" is a refreshingly honest, wholly original musical about seeing your parents through grown-up eyes. "Fun Home" features music by Jeanine Tesori, book and lyrics by Lisa Kron and direction by Sam Gold, whose work on this production earned them Tony Awards for Best Score, Best Book and Best Direction. With this win, Lisa Kron and Jeanine Tesori also made history by becoming the first female writing team to be awarded the Best Score Tony Award. 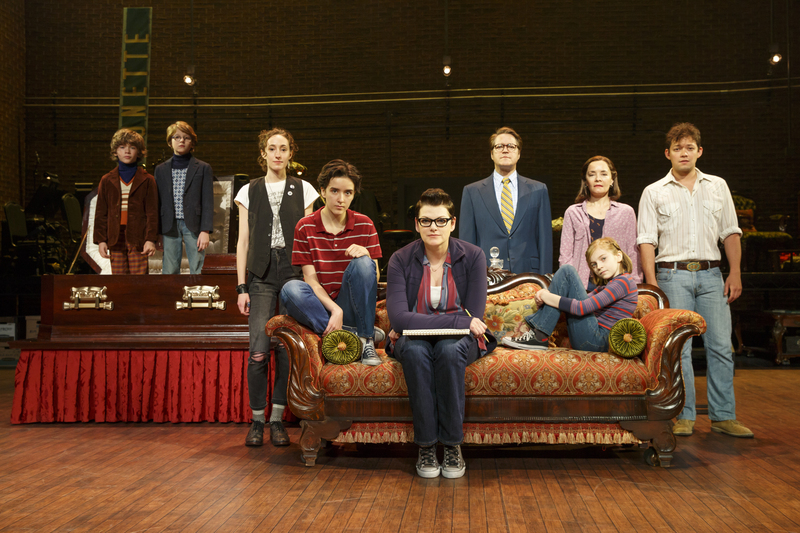 "Fun Home" was also nominated for 2015 Tony Awards for Best Scenic Design of Musical (David Zinn), Best Lighting Design of a Musical (Ben Stanton) and Best Orchestrations (John Clancy). The creative team also includes Danny Mefford (Choreography), Kai Harada (Sound Design), David Zinn (Costume Design) and Chris Fenwick (Music Direction). Tony Award-winning director Sam Gold, who staged both the Off Broadway and Broadway productions of "Fun Home," restaged the national tour. The Broadway production of "Fun Home" opened on Broadway at Circle in the Square Theatre on April 19, 2015 and ran through September 10, 2016. Producers Fox Theatricals (Kristin Caskey, Mike Isaacson) and Barbara Whitman are thrilled to announce the casting for the ASU Gammage engagement of the first National Tour of "Fun Home." Robert Petkoff (Broadway’s Ragtime, All The Way, Anything Goes) will play Bruce, Susan Moniz (Broadway’s Grease, Chicago’s Marriott Theatre, Chicago Shakespeare Theater) will play Helen and Kate Shindle (Broadway’s Legally Blonde, Cabaret) will play Alison. Joining them will be Abby Corrigan as Medium Alison, Carly Gold as Small Alison, Victoria Janicki as Joan, Robert Hager as Roy, Henry Boshart as John, Luké Barbato Smith as Christian, Anthony Fortino, Noelle Hogan, Caroline Murrah, Amanda Naughton and Michael Winther. At certain performances, Jadyn Schwartz will play the role of Small Alison. "Fun Home" was the event of the 2015 Broadway season, receiving raves from critics and audiences alike, winning five 2015 Tony Awards including best musical and making history along the way as the first show written exclusively by women to win theater’s highest achievement. It was named to all of the major top 10 lists including The New York Times, Associated Press, New Yorker, Entertainment Weekly, BuzzFeed, The Daily Beast, Chicago Tribune, The Hollywood Reporter and more. The Grammy nominated Original Broadway Cast Recording of "Fun Home" is now available on PS Classics, psclassics.com.